Blackfin DSPs from Analog Devices are quite popular digital signal processors applicable to audio, video, voice and image processing, multi-mode baseband and packet processing, control processing, and real-time security. Blackfin DSPs were among the first of MMU-less DSPs capable to run famous uCLinux in the times when uCLinux was not yet merged into mainline Linux kernel. 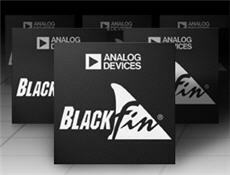 Analog Devices offers several families of their Blackfin DSPs. Oldest baseline BF53x family includes BF531, BF532, BF533, BF534, BF535, BF536, BF537, BF538, BF538F, BF539, BF539F processors. Entry-level BF531, BF532 and more powerful BF533 are very similar processors and differ only in performance and amount of on-chip SRAM memory. ADSP BF531, BF532 and BF533 feature up to 600MHz core, Parallel peripheral interface (PPI), 2 SPORTs, SPI and UART. BF536 and BF537 models are targeted at industrial and embedded networked applications. Again, they differ in performance and amount of on-chip SRAM memory. ADSP BF536/7 has 400 MHz processor core for BF536 and 600 MHz for BF537, 10/100 Ethernet MAC, Controller Area Network (CAN) 2.0B Interface, Two-Wire Interface (TWI) Controller, 2 UARTs, SPI controller, Parallel Peripheral Interface (PPI) and 2 SPORTs. ADSP BF538 is quite similar to BF533 processor but extends it with additional peripherals targeted for industrial and automotive markets. BF538F stands for BF538 with on-chip flash memory. 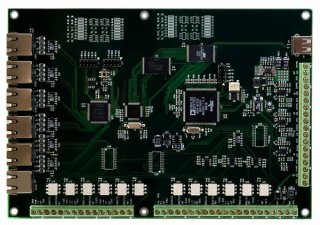 BF538 has 600MHz core, Parallel Peripheral Interface (PPI), 4 SPORTs, 3 SPI ports, 3 UARTs, RTC, CAN controller compliant with CAN 2.0B (active) standard, 2 TWI (I2C) controllers, 2 DMA engines. Also there is a dual-core BF561 processor with similar functionality to BF533. It looks like Analog Devices combined two BF533 IP cores and glue logic/caches to form BF561. Being not able to compete with TI giant in powerful, general purpose DSPs, Analog Devices adjusted strategy for Blackfin and made a significant switch to application specific markets for newer Blackfin processor families. After rolling out BF54x and BF52x families, the tendency becomes even more evident with introduction of BF51x, BF50x and BF592. On picture below you can see a famous BF533-STAMP, the first printed circuit board with uCLinux and BF533 processor designed and released under open source license. 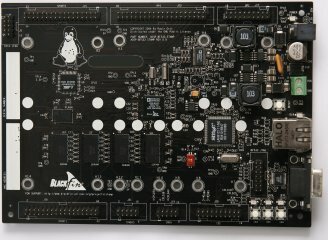 In hardware section on blackfin.uclinux.org there is a couple of STAMP boards and dozen of daughterboards – a good starting point for engineers looking for cheap Blackfin development boards and willing to learn Blackfin processors.